Have you been practicing and wanted to slow down the video so you can play along easier? With the help of the Google Chrome browser you can make this possible following the instructions below. Picture instructions are also included to help make it even easier to follow. 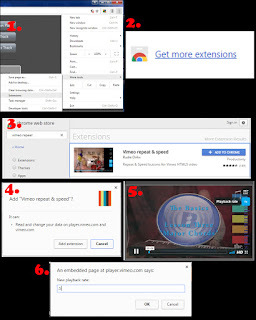 1.On the right side of your Google Chrome browser go to "More Tools" and then "Extensions"
2. Scroll to the bottom of the page and look for "Get more extensions"
3. Once the chrome web store opens search for "Vimeo repeat" and select the "Vimeo repeat & speed". Click "+ Add to Chrome"
6.Enter a new playback rate to adjust the speed. You can enter as low as .5 to go half speed and still have audio, but you can adjust it to whatever speed is best for you. With these easy to follow steps it will help you to take lessons at your own speed and slowly speed up as you progress. If you have any questions feel free to comment on this post and we will help you out. If you're new to Piano head over to www.BSharpTricks.com and see all the great content that is available.